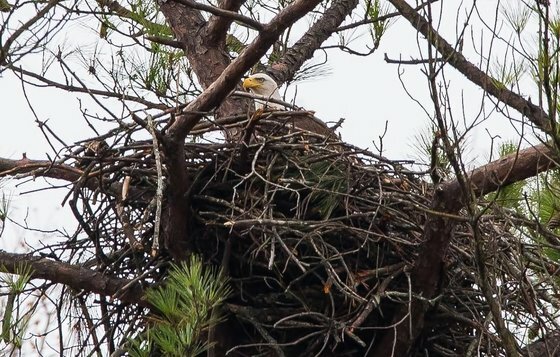 The count of active bald eagle nests in Georgia soared to a record high this year. Aerial surveys finished last month detected 218 occupied nest territories. That eclipses the record of 210 set in 2015 and continues for a third straight year the state’s streak of 200-plus active eagle nests. Mirroring a comeback across the species’ range, bald eagles have rebounded in Georgia from no known nests in 1970 to nests this year in at least 68 counties, according to survey leader Bob Sargent. In the last 10 years, the number of occupied nest territories in the state has almost doubled. “The recovery of the bald eagle in Georgia is a truly inspiring success story. This is a 7-foot-wide soaring example of the effectiveness of the Endangered Species Act,” said Sargent, a program manager with DNR’s Nongame Conservation Section. Buy or renew a DNR bald eagle or hummingbird wildlife license plate. These tags cost only $25 more than a standard license plate, and $19 of each purchase and $20 of each annual renewal goes to help conserve eagles and hundreds of other species listed as species of conservation concern. Learn more about what DNR is doing to conserve these creatures and the habitats they need to survive. On March 21, the rusty patched bumblebee (Bombus affinis) became the first bumblebee listed as endangered under the Endangered Species Act. 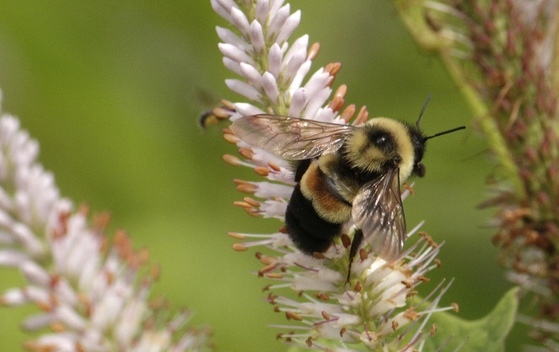 Before the 1990s, rusty patched bumblebees were abundant and seen throughout the Canadian provinces of Ontario and Quebec as well as in 28 states from the eastern U.S. to the Midwest. North Georgia marked the southern edge of the species’ range. Yet in the last few decades, the population of rusty patched bumblebees has crashed. It is believed the species now persists in only a few scattered locations in approximately 0.1 percent of its historic range. Read Anna’s blog about the plight of these bees, plus what and where to look. If you see a possible rusty patched, send a GPS coordinate (or map of the site), the date and photo to Bumble Bee Watch and DNR at anna.yellin@dnr.ga.gov. Xerces Society pocket guide to identifying rusty patched bumblebees. "Forgotten but not gone: the rusty-patched bumble bee" (bioGraphic). Anna Yellin is environmental review coordinator for DNR’s Nongame Conservation Section. Brown-headed cowbirds are common throughout Georgia. But while not one of the most striking birds visiting our yards, it is undoubtedly the one with the most bizarre breeding behavior. The reason for this? The brown-headed cowbird is a brood parasite: It does not build a nest or raise its own young. 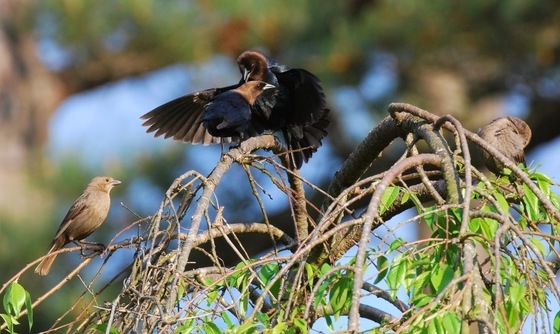 Read the rest of Terry’s column to learn how brown-headed cowbirds use other birds’ nests and what impact that has on different species. One of Georgia’s most rare vascular plants has been re-discovered. Rush quillwort (Isoetes junciformis) is known worldwide only from a floodplain just north of Tifton. This primitive fern ally was first documented in 1970 by Valdosta State University botanist Wayne Faircloth. 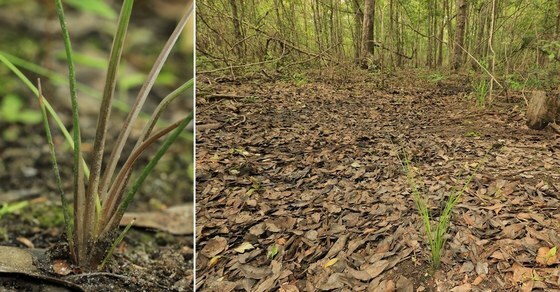 But after being described as a new species in 1999, rush quillwort had not been seen again until last month when Alan Cressler of the U.S. Geological Survey and fellow botanist Steve Bowling found 50-60 plants. The find represents an extension of the original Tift County site, DNR botanist Tom Patrick said. Isoetes junciformis, which inhabits bare-soil depressions in the wooded floodplain, is called rush quillwort because of its resemblance to path rushes in the genus Juncus. A volunteer trained by the Georgia Plant Conservation Alliance will monitor the Tift County site and help safeguard the quillwort by cultivating plants and sharing knowledge and extra plants with botanical gardens. A national study of Americans’ relationship to nature reveals both an alarming disconnect and widespread opportunity to re-engage. “The Nature of Americans National Report: Disconnection and Recommendations for Reconnection" defines the gaps between interest and action – such as eight-in-10 children liking outdoor activities yet parents saying their children spend triple the time on electronics that they do outside – and recommends ways to bridge them. The state’s newest wildlife management area, Alligator Creek in Wheeler County, ranked as a top-five unprotected site for gopher tortoises in Georgia before its acquisition. With help from partners such as The Nature Conservancy, the 3,086 acres near Lumber City now offer protection for and public access to a site prized for its ecology and geology. The lone chick in The Landings osprey nest has died after being hurt when the parents were attacked and harassed (video) by at least one other osprey. It's likely the two other eggs in the live-streamed nest were not fertilized, although the parents continue to incubate them, according to the Cornell Lab of Ornithology. 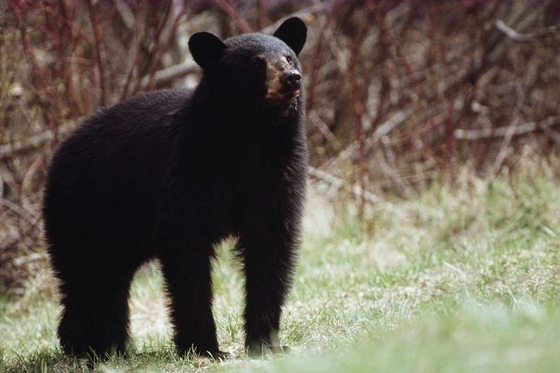 Young black bears in search of territory – and sometimes older bears that are roaming – occasionally turn up in metro Atlanta and other developed areas during the spring. Here's what to do if you see one. Also watch these videos: caught and released and sightings and tips. Georgia’s 12th annual Youth Birding Competition drew a diverse crowd of about 80 birders ages 4-18 who learned about and enjoyed the outdoors as they scoured the state for birds April 29-30. The Chaotic Kestrels, a team of five teens, was the overall winner with 160 species. 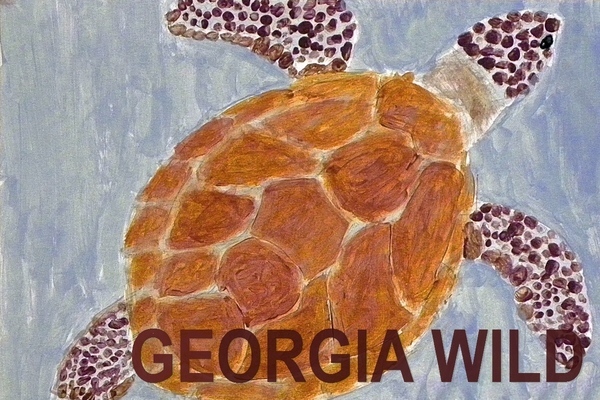 The 12 statewide winners in the Give Wildlife a Chance Poster Contest can be seen online. More than 1,500 kindergarten through fifth-grade students took part in the 27th annual conservation art competition organized by DNR and the State Botanical Garden at the University of Georgia. Swainsboro Middle School seventh-graders visited Ohoopee Dunes WMA last month to learn about sandhills animals, plants and habitats. 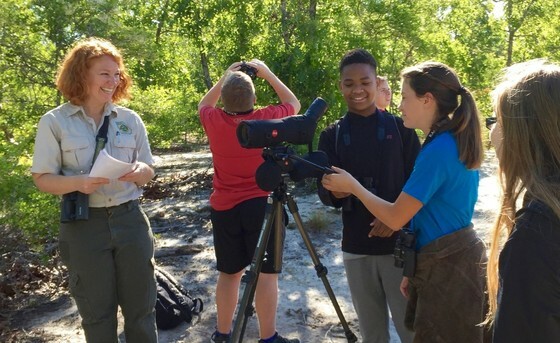 The trip organized by teacher Deanna Ryan and others included DNR’s Dr. Mincy Moffett, Rebecca Byrd and John Thrift, plus binoculars loaned by Atlanta Audubon Society. Sea turtle nesting season in Georgia kicked off with a loggerhead nest on Cumberland Island May 1 and has since topped 150 nests, including a rare leatherback nest. Beach-by-beach updates. At Samuel Hubbard Elementary in Forsyth, a bog garden created by Tiffany Smith’s third-graders is almost finished. 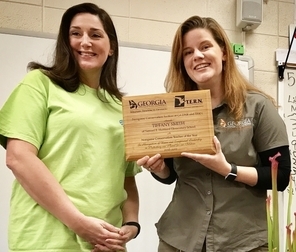 As the 2016 Conservation Teacher of the Year, Smith (left in the photo, with DNR's Linda May) received a $1,000 grant for the project from DNR and The Environmental Resources Network, friends group of the Nongame Conservation Section. Catch five different bass species in Georgia and you have a Georgia Bass Slam! DNR’s new angler recognition program promotes conservation and management of the 10 black bass species recognized in the state. The Georgia Plant Conservation Alliance has grown to 44 members with the addition of Georgia ForestWatch and Ecological Solutions Inc. The GPCA is a network of agencies, public gardens, schools and environmental organizations committed to preserving Georgia’s endangered flora. Names in the news: The U.S. 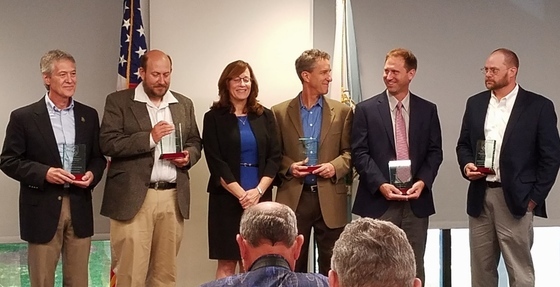 Fish and Wildlife Service presented the following five DNR employees a Regional Director's Honor Award for Conservation Partners on May 11 (pictured from left, with Fish and Wildlife Southeast Regional Director Cindy Dohner): Nongame Conservation Section Chief Dr. Jon Ambrose, nongame Assistant Chief Matt Elliott, Real Estate Chief Steve Friedman, Program Manager Jason Lee and wildlife biologist Brent Womack. The service said DNR’s Wildlife Resources Division has taken the lead on working with partners to establish new and expanded conservation lands at strategic locations, including adding to Paulding and Sheffield Forest wildlife management areas in northwest Georgia and “significant efforts” to expand the lower Altamaha River conservation corridor. DNR wildlife biologist Emily Rushton helped explain wildlife management to third- and fourth-graders at the second annual Heard County Farm Day in Franklin May 2. A manual for propagating native Georgia perennials for pollinators is available online from State Botanical Garden of Georgia conservation horticulturist Heather Alley. – Right whale calving nears record low. – Profile of Alapaha River WMA, a storied site. – Terry W. Johnson goes zebra hunting in Georgia. 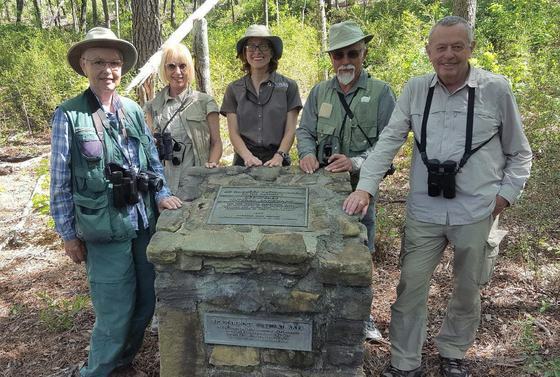 Four British birders touring Georgia’s Coastal Plain received rare insights into Big Hammock Wildlife Management Area when they recently happened across DNR’s Lisa Kruse and Rebecca Byrd working at the Big Hammock entrance. 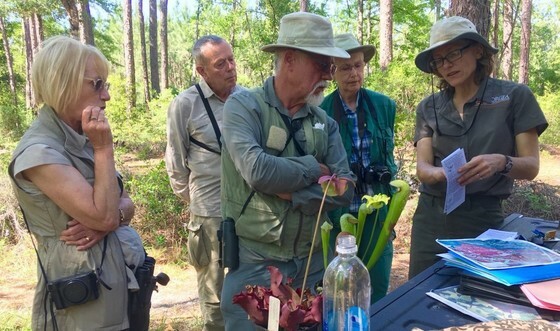 Kruse, a botanist, and Byrd, who starts as Atlanta Botanical Garden’s conservation coordinator June 1, explained the natural history of the WMA near Glennville. The birders – Eric and Gail Hampshire and Richard and Sue Rose, all from Worcester, England – have traveled around the world, though not always as a group. They told Kruse their trip to Georgia was spurred in part because they subscribe to the Georgia Wild newsletter and were impressed with the state’s diverse biology and focus on conserving native wildlife, plants and natural habitats. Excited to share, Kruse writes that she was "so happy, I pulled out all my maps and pamphlets and expounded on the amazing biogeography of Big Hammock.” She and Byrd also led the group up a sand ridge to see old-growth longleaf and the world’s largest known population of Georgia plume. Nature-based tourism is big. Wildlife-watching in Georgia involved 2.4 million U.S. residents and rang up $1.8 billion in expenditures in 2011, per the latest U.S. Fish and Wildlife Service survey. And that's not counting international visitors.